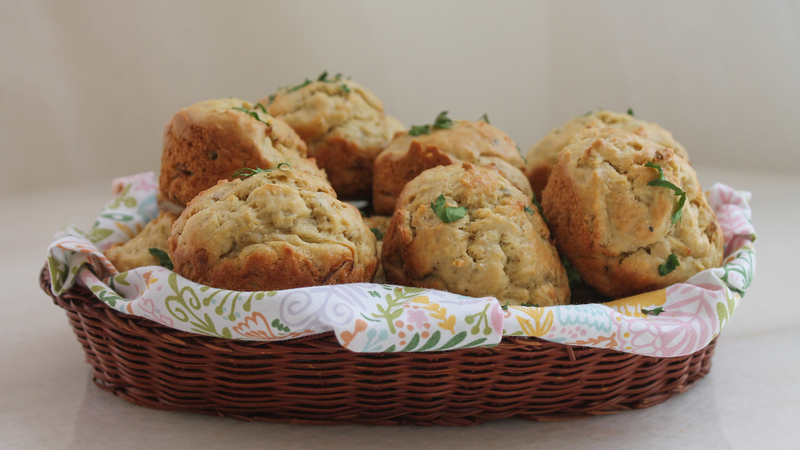 Roasted eggplant, tahini, garlic and a little cumin give these baba ganoush muffins all the flavor of that wonderful dip, in small portable packages. They are perfect with a cold beer, red wine or even something sparkling. I am a firm believer that you can make pretty much anything into a muffin. It just requires some imagination and the creation of a fusion recipe, taking the ingredients of one dish and turning it into something completely different, but just as delicious. If you’ve been reading along here for a while, or follow me on social media, you might know that banana cream pie is his favorite dessert, his special request on his birthday or Father’s Day. Interesting idea. Banana cream pie muffins. I’m not even going to google it because, in all likelihood, someone’s already done one. But check back next month to see if I succeed. Meanwhile, roast youself an eggplant and make some savory Baba Ganoush Muffins. They are really rather special too. 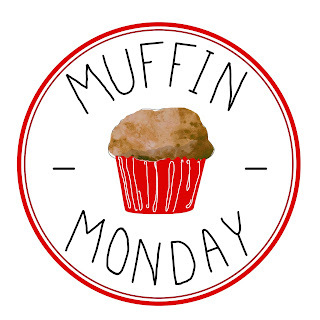 Preheat your oven to 375°F or 190°C and grease a 12-cup muffin pan with a little butter or oil. Put the charred eggplant on a baking sheet and put it into the oven for about 20-25 minutes or until it’s completely cooked through. 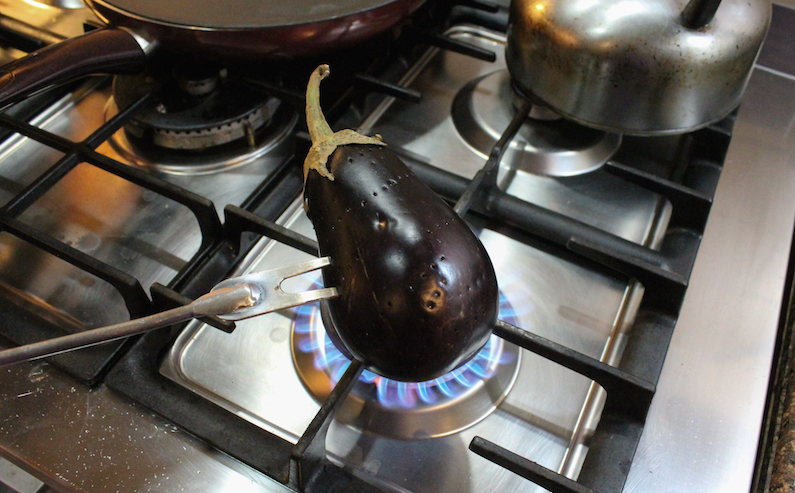 Remove the eggplant from the oven and set it aside to cool. 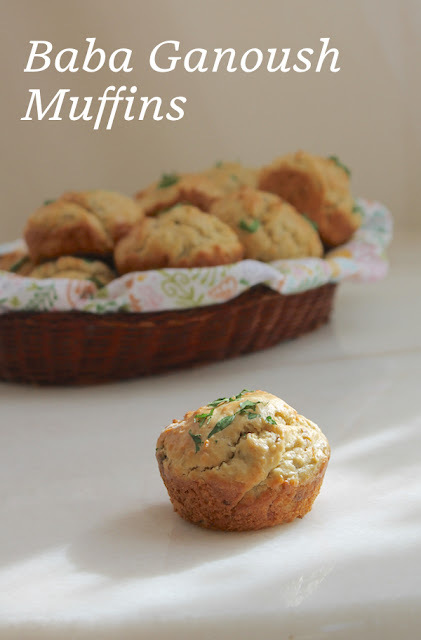 Meanwhile, you can be getting the rest of the muffin ingredients ready. In a large mixing bowl, whisk together your flour, salt, baking powder, cumin and a few generous grinds of fresh black pepper. 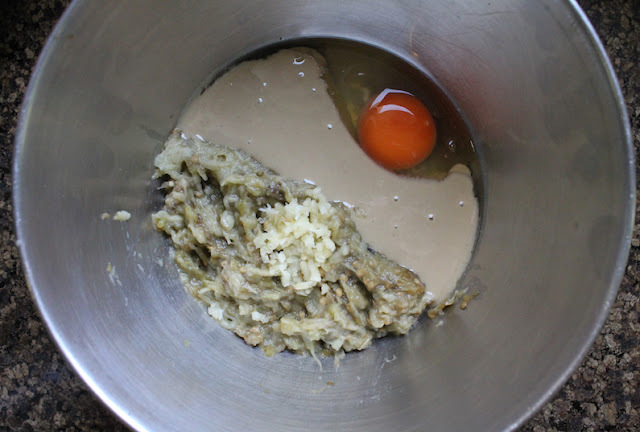 In another bowl, measure out your tahini and milk and add in the egg. 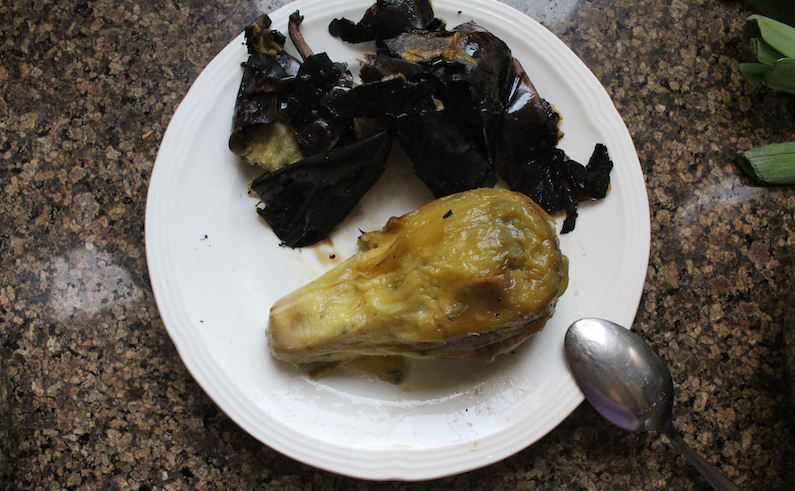 When the eggplant is cool enough to handle, remove the peelings and discard. Mash the flesh with a fork. Add it to the wet ingredient bowl along with the garlic. Stir well to combine. 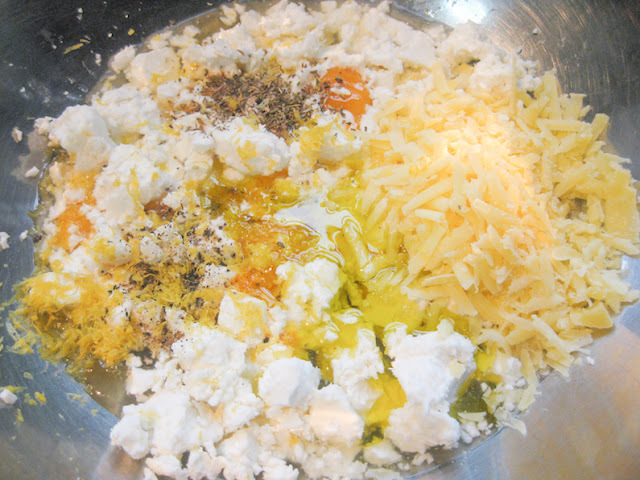 Fold the wet ingredients into the dry ingredients until just mixed. 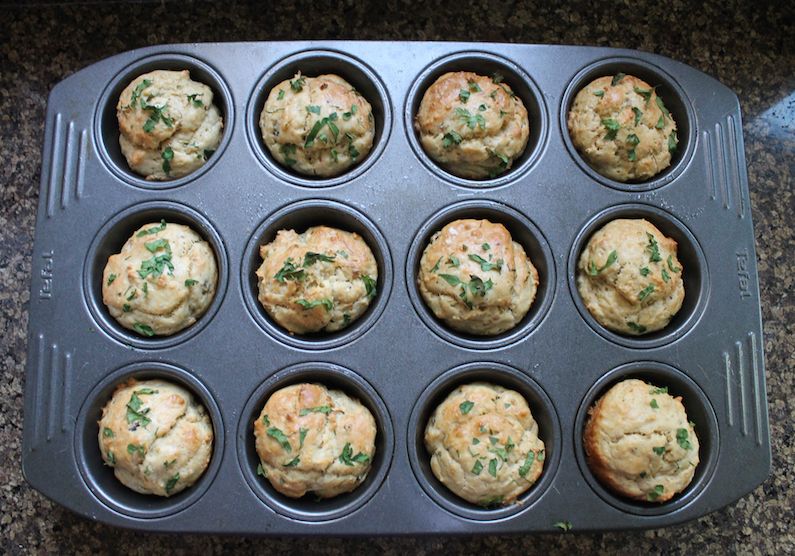 Divide the thick batter between the 12 muffin cups. Top with a little chopped parsley for color, if desired. 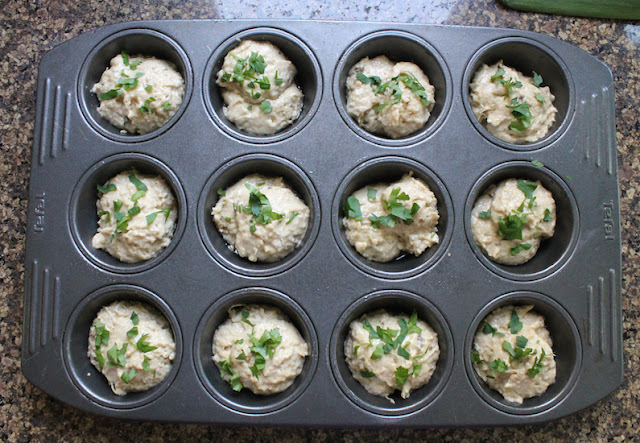 Bake in your preheated oven about 20-23 minutes or until the tops and sides are golden. Remove from the oven and leave to cool for a few minutes in the pan. Then removed them from the pan and leave to cool on a wire rack. Crispy outside and savory inside, a slice of this rich cheesy shrimp spinach filo pie makes a great main course or addition to a brunch table. Traditional fish pie with a creamy sauce, topped with mashed potatoes or puff pastry is one of our favorite things to eat, especially in a cozy pub on a chilly day. 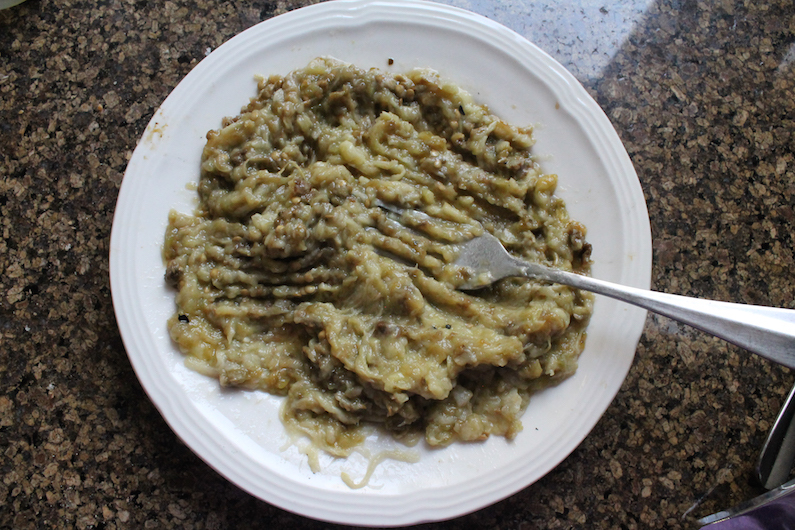 So when our organizer, Wendy of A Day in the Life on a Farm asked for host volunteers, I stepped forward thinking January would be the perfect time for a rich fish pie. And, indeed, we are experiencing a bit of a chill here in Dubai. But, I’ll be honest, it’s not that cold. 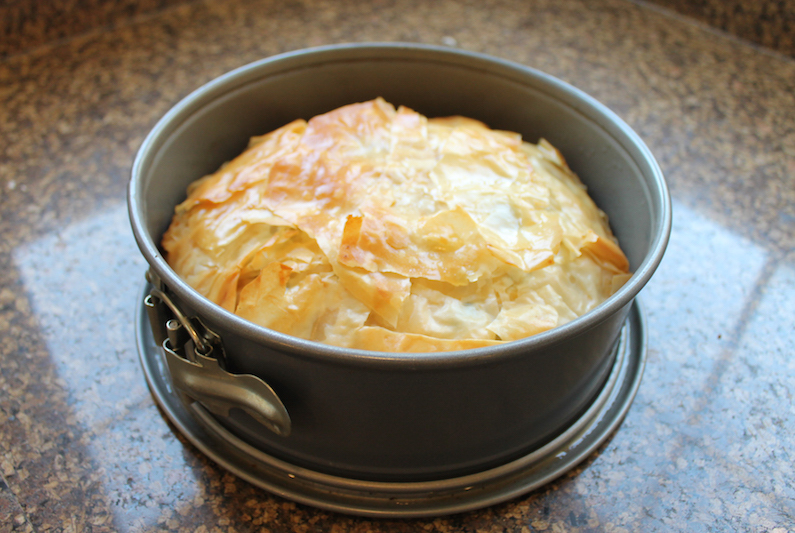 Also, from another project, I had some leftover filo pastry in the freezer that needed using up. If you’ve ever worked with filo, you know it can crack and break. But what I’ve figured out is that if you use the relatively whole pieces to make the bottom of the crust, you can just keep layering the small pieces and brushing them with butter and they come together nicely to complete a crunchy top. 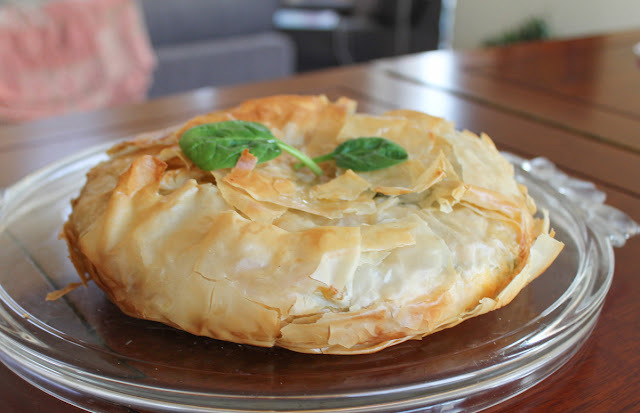 Note: Keep the filo pastry covered with a damp cloth, removing one piece at a time as you layer the crust. 2-3 large handfuls baby leaf spinach - don’t get hung up on weight. Just toss it in. 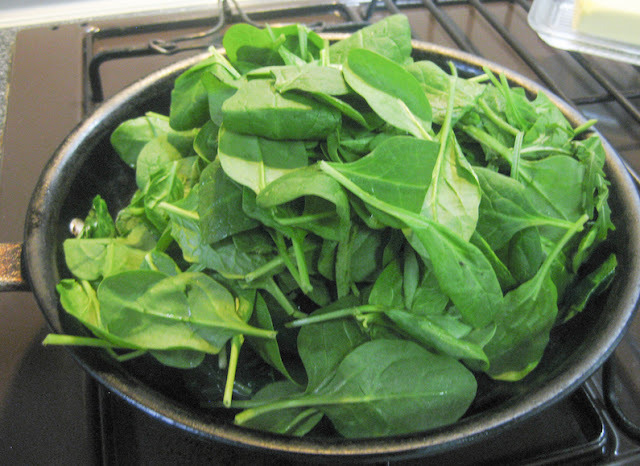 In a medium saucepan, heat a drizzle of olive oil and add in your spinach with a sprinkle of salt and a good couple of grinds of black pepper. Cook for a few minutes, or until the spinach has wilted. Remove from the pan and drain in a colander. Add another drizzle of oil to the pan and cook the shrimp until pink, again adding a sprinkle of salt and a good couple of grinds of black pepper. Remove from the heat and leave to cool. In a large mixing bowl, add your eggs, feta, cheddar cheese, lemon zest, herbs and some black pepper. Whisk to combine. 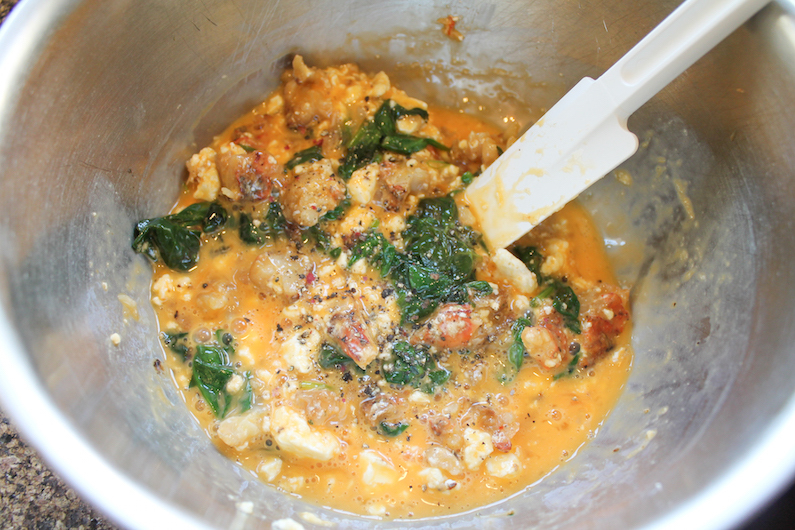 Fold in the drained spinach and the shrimp and add some more black pepper and cayenne, if desired. Brush the bottom of your baking pan with butter. 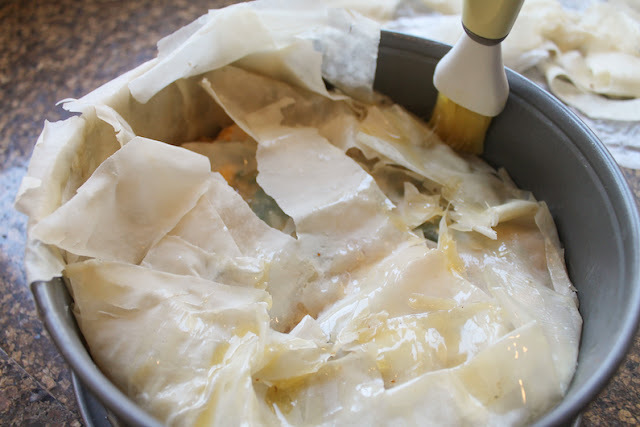 Layer your filo sheets one at a time, into the pan, brushing them with the melted butter before adding the next sheet. I had about 3 relatively intact sheets and lots of bits. Leave the ends hanging over the sides. Pour in the filling and smooth out the top. 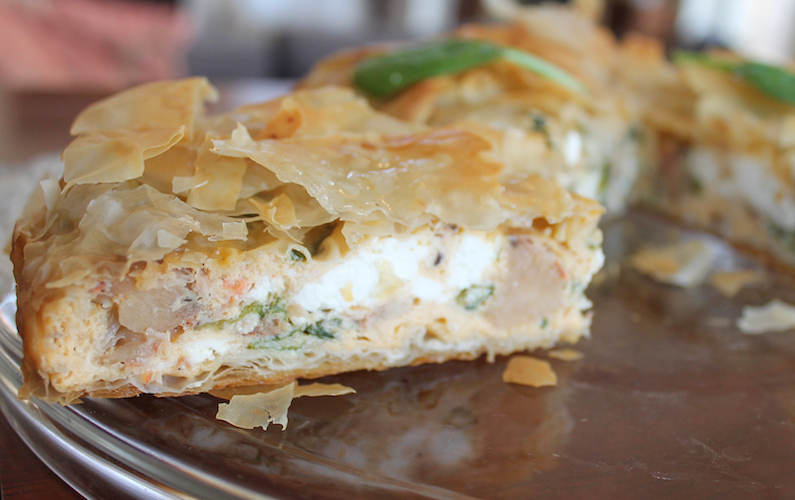 Start laying the bits of filo on top, brushing with butter as you go. 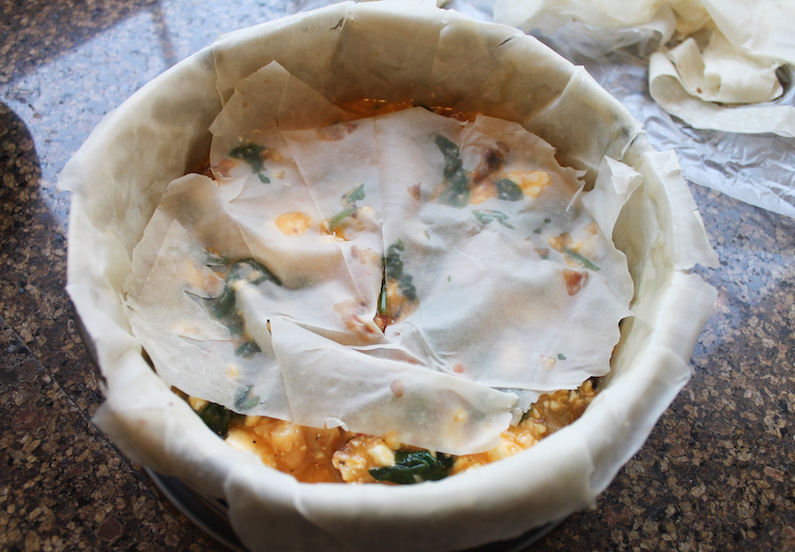 Just keep adding filo and buttering until the top is a few layers thick. Finally fold the overhanging filo sheets over the filling, covering the top as best you can. Brush the top and around the sides with more butter and use any broken pieces of filo to cover any holes in the top. 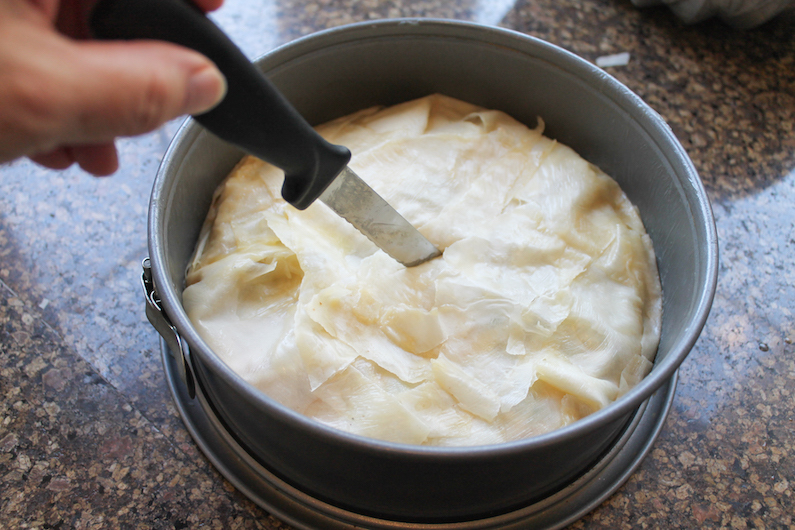 Use a sharp knife to make a vent hole in the middle of the pie so steam can get out and your filo will get crispy. Bake in your preheated oven for 35-40 minutes or until the top is golden brown. 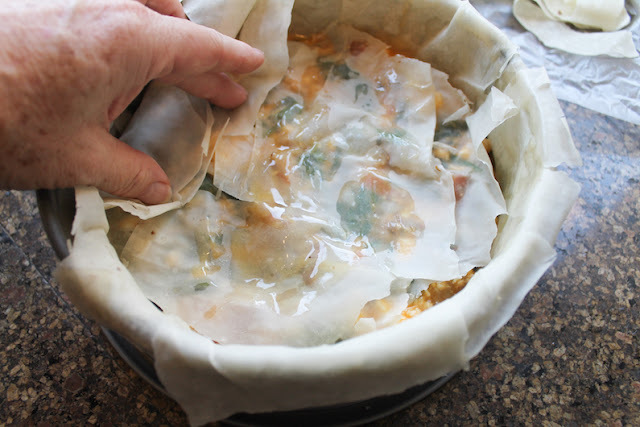 If it’s browning too quickly, you can cover the top with foil. Remove from the oven and leave to rest for about 15-20 minutes before attempting to slice it. 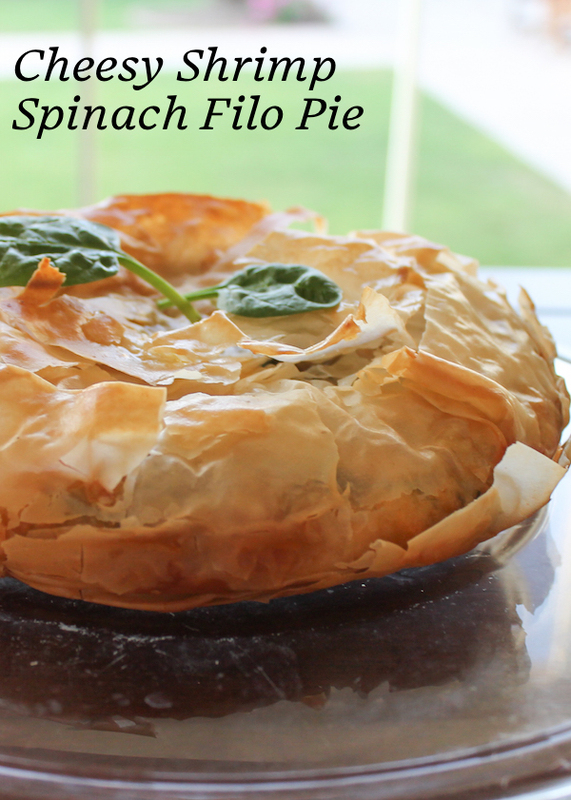 Are you a fan of fish or seafood pies too? Then you are going to love this linky list! Click on the photos to see the recipes. This Lemon and Prosecco Bundt is perfect for any celebration where you want the guest of honor to feel special. After all, there is nothing like the pop of a cork to herald the beginning of a party. The fact of the matter is that everyone has a birthday. That is part of the human condition. We are born. We have a birthday. 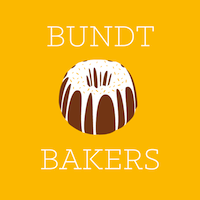 So right here at the beginning of a new calendar year, our Bundt Bakers host Sue from Palatable Pastime proposed that we share birthday cakes to celebrate. Thanks, Sue! What an excellent idea! I drew a blank. Then I thought, what makes a party more festive? Well, sparkling wine, of course. 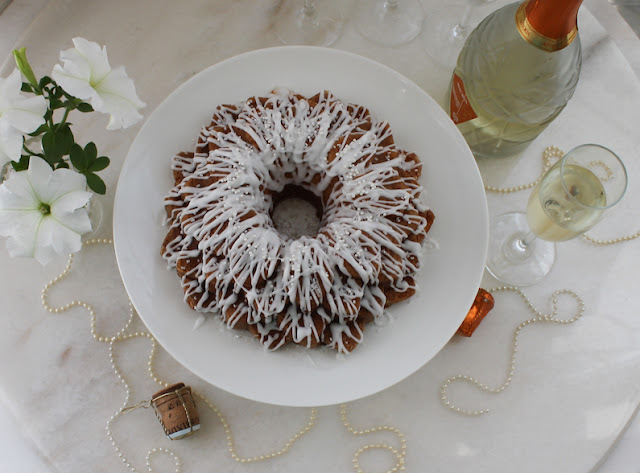 A quick Google search for Champagne cake recipes turned up 5,300,000 results! Clearly this was not a new idea. To make it my own, I added a little lemon to the mix. And because a good Prosecco is usually cheaper than a good Champagne, I switched that up too. Despite the cheesy cut glass bottle, this one comes highly recommended and we usually buy a decent stock at an end of the year sale. Today just happens to be the birthday of someone very special to me, my friend, Jane. She is sweet and kind and more generous than anyone I know. She also has a wickedly delightful sense of humor. But what I love most about her is her loyalty and faithfulness and courage. It's been a rough few years for her and her family and she has managed to keep the faith and make the rest of us still smile through her tears. If you happen to read this, Jane, I love you! I wish I could send you this cake, or better yet, be there to bake it for you for your special day. Happy Birthday! To decorate - optional, but, hey, it's a birthday party! Preheat your oven to 350°F or 180°C. Grease the Bundt pan liberally with butter and shake in some flour to coat. 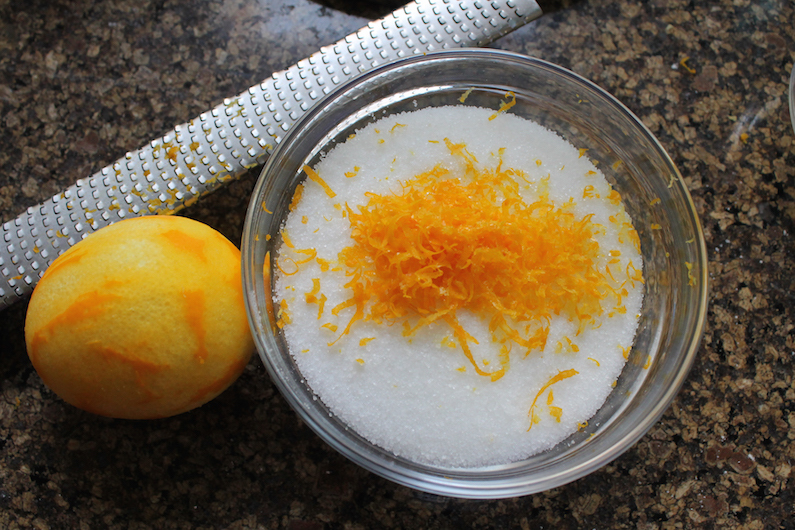 Zest your lemon into the sugar and mix it around thoroughly so the zest will flavor the sugar. Set the bowl aside. Place the flour, baking powder, baking soda and salt in a bowl and whisk to combine. This aerates the flour and eliminates the need to sift. 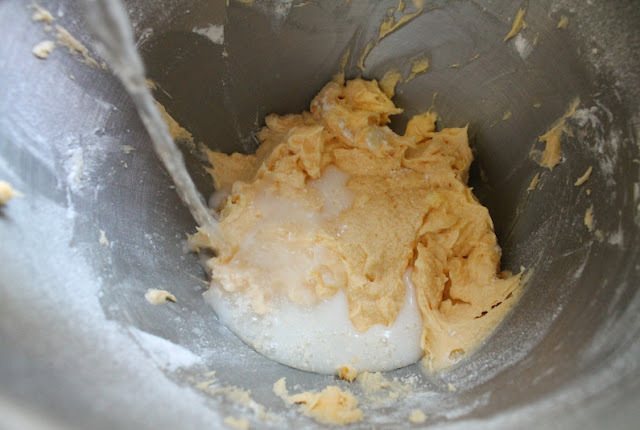 Put the butter, lemon sugar and lemon juice into a mixing bowl or the bowl of your stand mixer and beat until light and fluffy, about 2 minutes. Add the eggs, one at a time, beating until fully incorporated, scraping the bowl down in between additions. 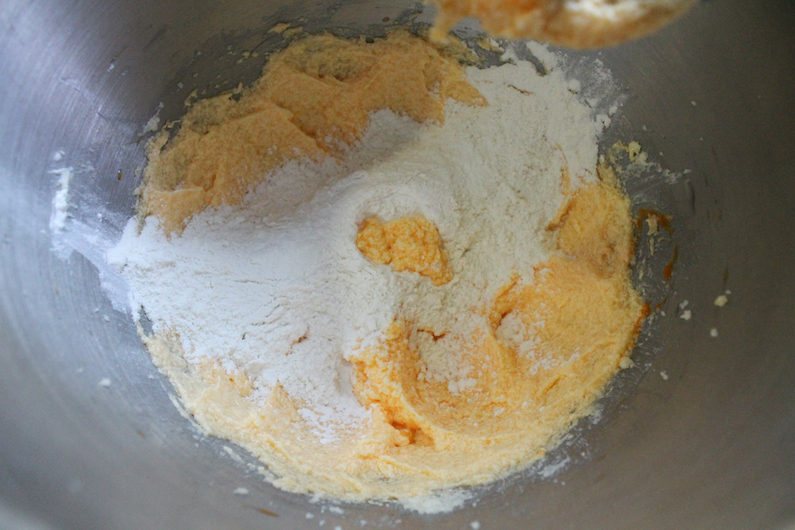 Add half of your flour mixture and beat until incorporated. Scrape the side of the bowl down, then add half of the Prosecco. Beat again until thoroughly mixed. Repeat with the rest of the flour and the rest of the Prosecco. Spoon the batter into your prepared Bundt pan. Bake on the middle rack of your preheated oven for about 30-35 minutes, or until golden on top and a wooden skewer inserted in the middle comes out clean. 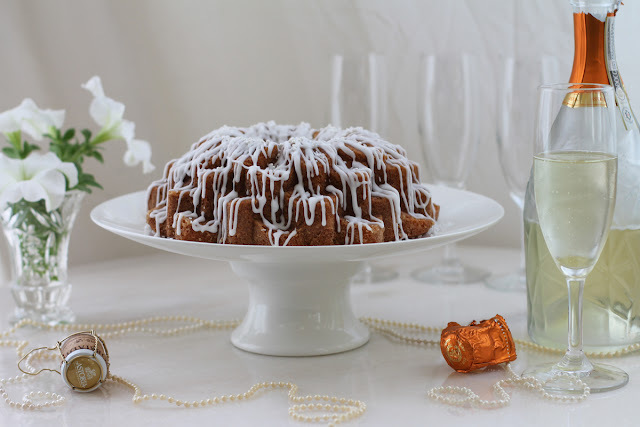 While the cake bakes, make the soaking syrup by combining the sugar and the Prosecco. Stir till the sugar dissolves. When you remove the cake from the oven, drizzle the bottom with a few teaspoons of the soaking syrup. 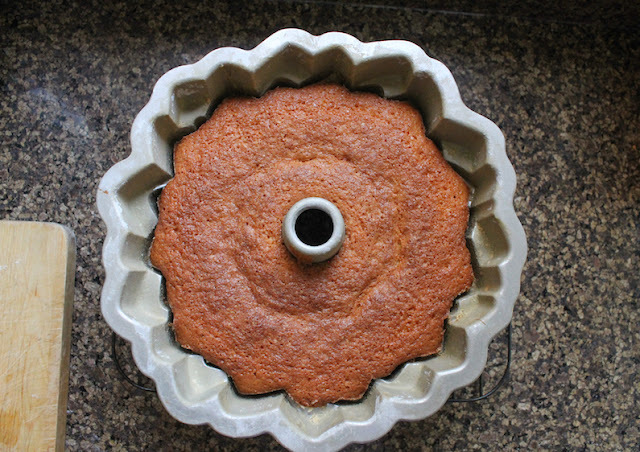 Leave the cake to cool on a wire rack for 10-15 minutes then invert and remove the cake from the pan. 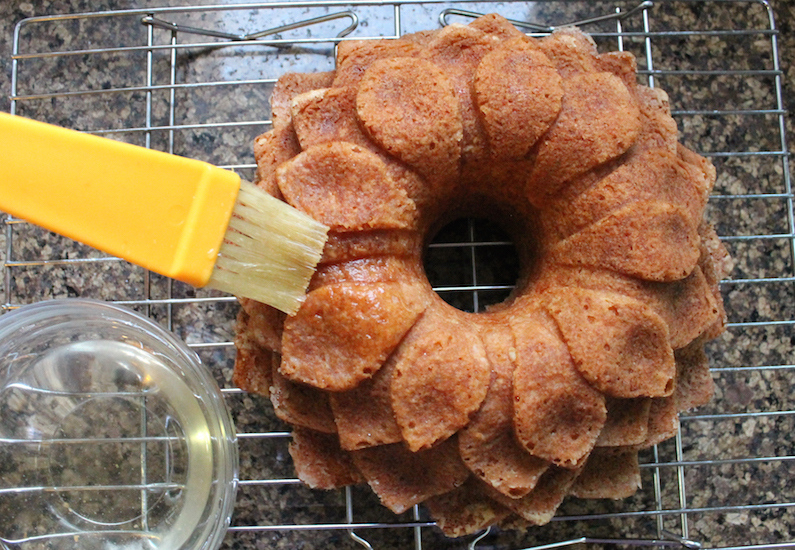 Gently brush or spoon the rest of the soaking syrup on the cake. Leave to cool completely before glazing. 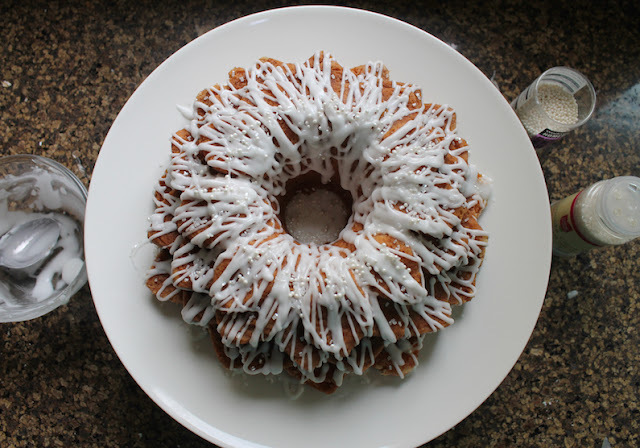 To make the glaze, put your powdered sugar in a bowl and add Prosecco a teaspoon at a time, stirring with each addition, until you have a good drizzling consistency. 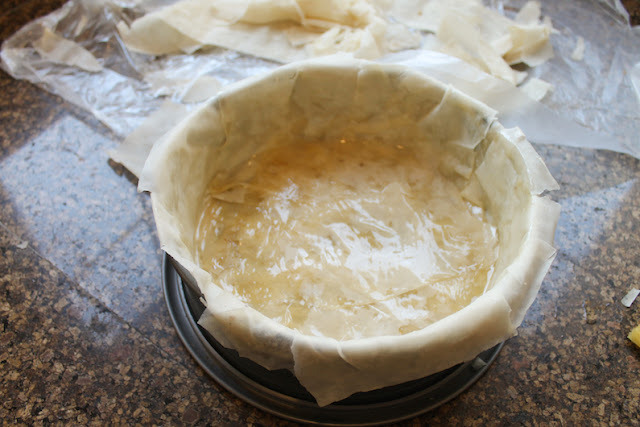 Use a piping bag or a Ziploc bag with a tiny corner cut off to make drizzling easier. If you are using sprinkles to decorate, have them at the ready because the surface of this glaze dries quickly. If you don’t sprinkle them on immediately, the sprinkles will just bounce off. 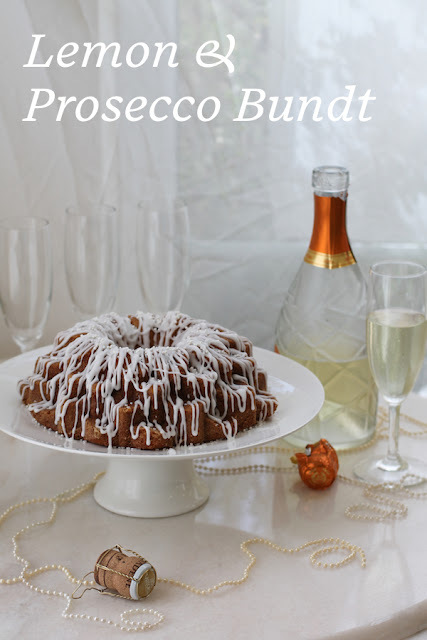 Pour everyone a glass of the Prosecco, cut the cake and enjoy! What is your favorite birthday cake? Are you committed to the same one every year or do you mix it up? Perhaps you'll find a new favorite in the ones we are sharing today. 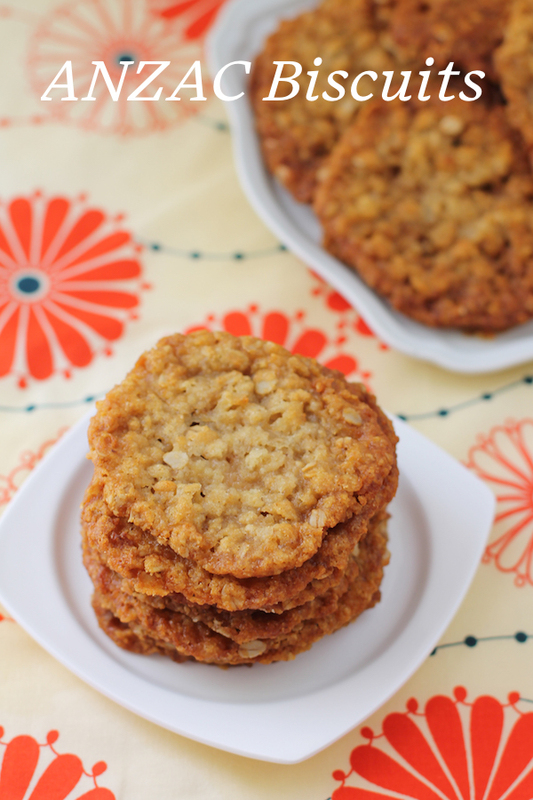 ANZAC biscuits are a traditional cookie Down Under made with oats, coconut and golden syrup. These biscuits – always biscuits and never cookies – can be baked chewy or crispy and that’s a point that divides families. 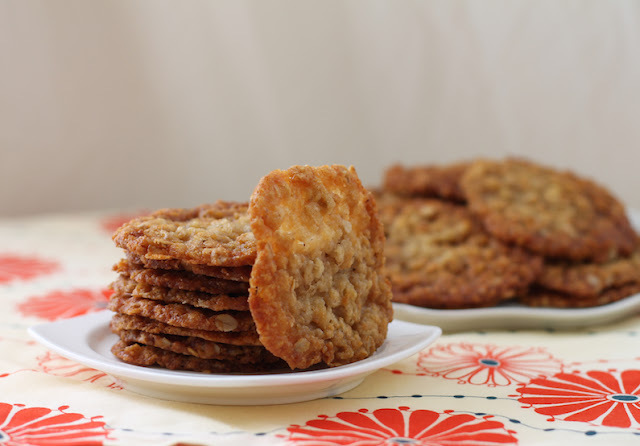 This month our Creative Cookie Exchange group theme is Healthy Cookies. 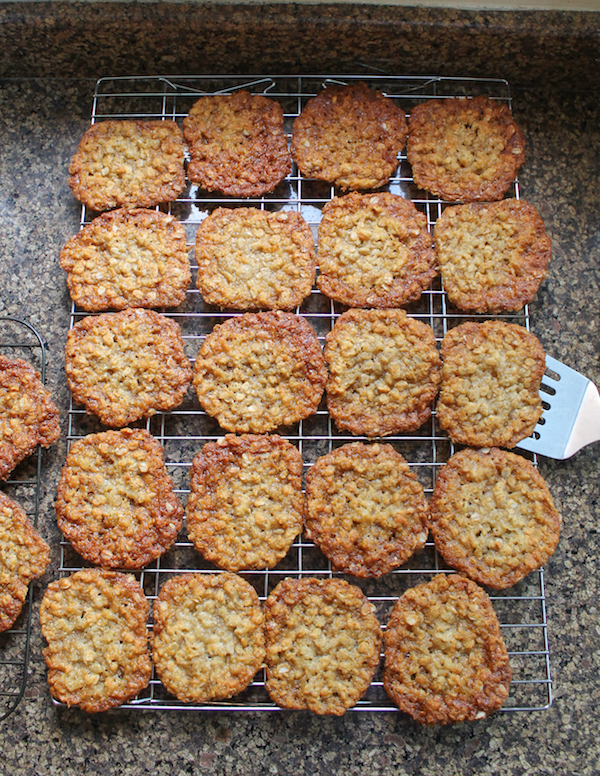 My younger daughter and I were brainstorming ideas – I was pushing for a homemade Hobnob (a crispy oat cookie) when she suggested ANZAC biscuits. 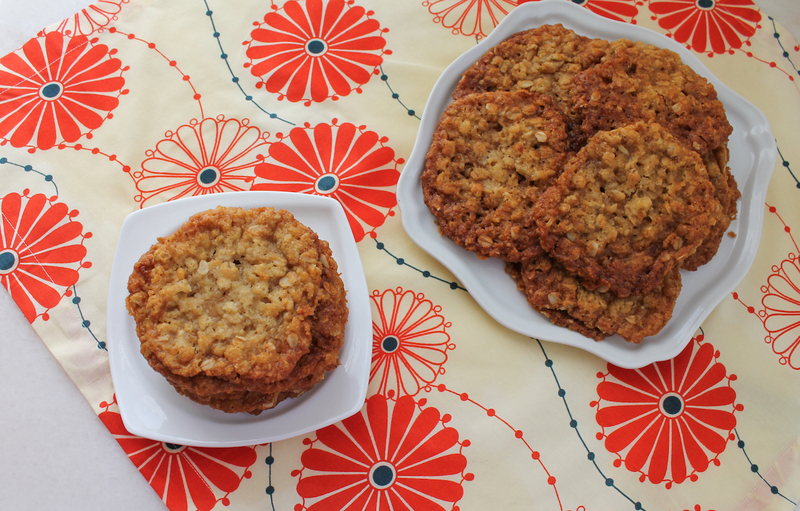 When we lived in Kuala Lumpur the first time, we enjoyed home baked ANZAC biscuits at least once a year, when one of our Australian friends made them for ANZAC Day. Happily, she also shared her recipe. ANZAC stands for Australian and New Zealand Army Corps, a joint outfit that fought together during World War I. ANZAC Day, which falls on April 25th every year, is a national holiday in Australia that has grown from its original intent in 1916 to honor the more than 8,000 Australians who died in the campaign to take Gallipoli, to a day to honor all who have fallen in military and peacekeeping missions. There are several stories about the origin of ANZAC biscuits. One says that they were baked to send overseas in care packages to soldiers. More likely, say historians, they were created and baked to sell at fundraisers to collect money for the war effort. Original ANZAC biscuits were made only of flour, oats, and butter with syrup as the binding agent. They had a long shelf life and were full of energy and nutrition. Coconut has become a popular, later addition. First, a word about the units of measure. Australian cups and tablespoons are not the same volume as American cups and tablespoons. Mercifully, the teaspoons are equal. To make this the least complicated as possible, I’m going to leave the cups the same, since they are 1:1 anyway, but add the gram measurements of an Australian cup of rolled oats, flour, sugar and butter, if you want to use a scale. 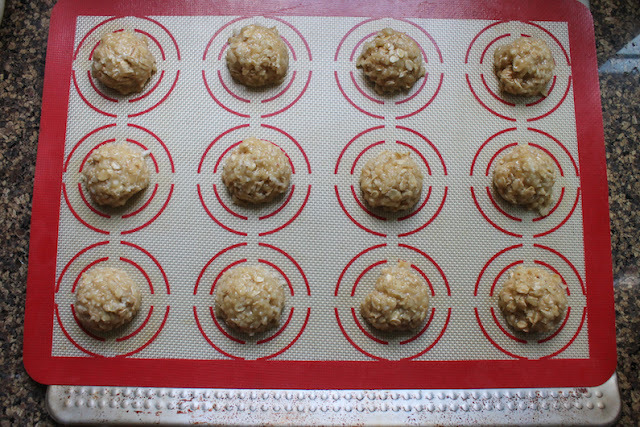 Preheat your oven to 300°F or 150°C and line two cookie sheets with baking parchment or silicone liners. 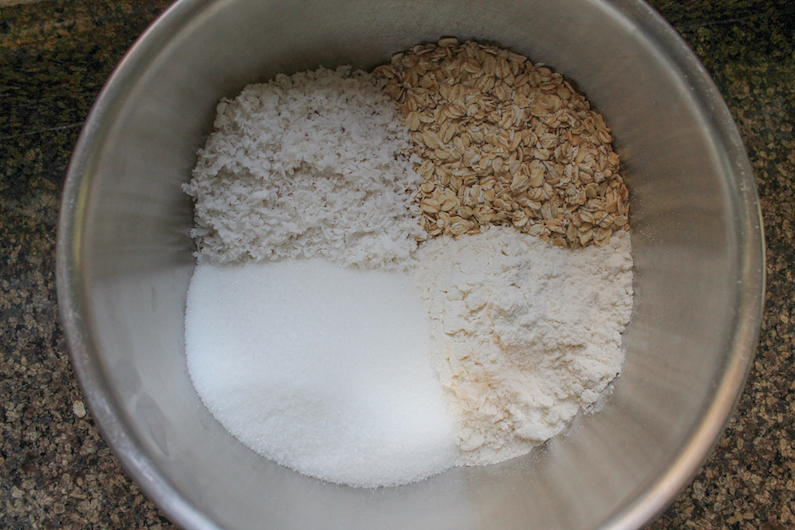 Combine oats, flour, sugar and coconut in a large bowl. 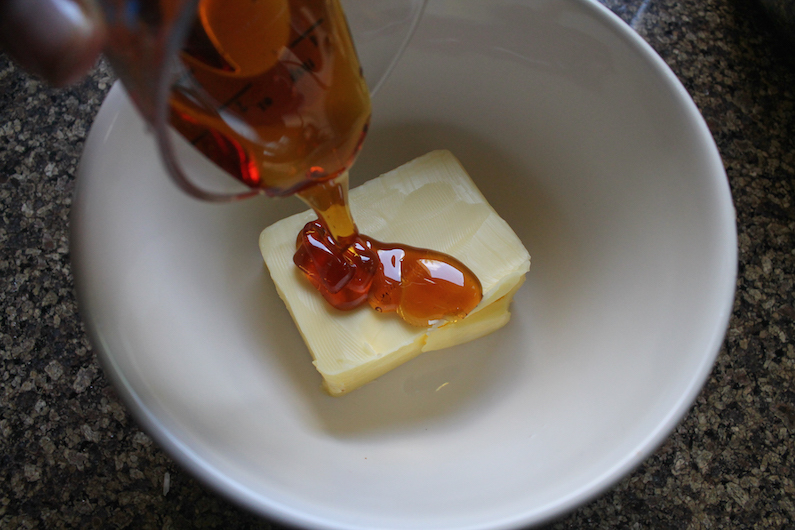 Combine butter and golden syrup in a saucepan (or microwaveable bowl) and use your heat source to warm them gently until the butter is melted. 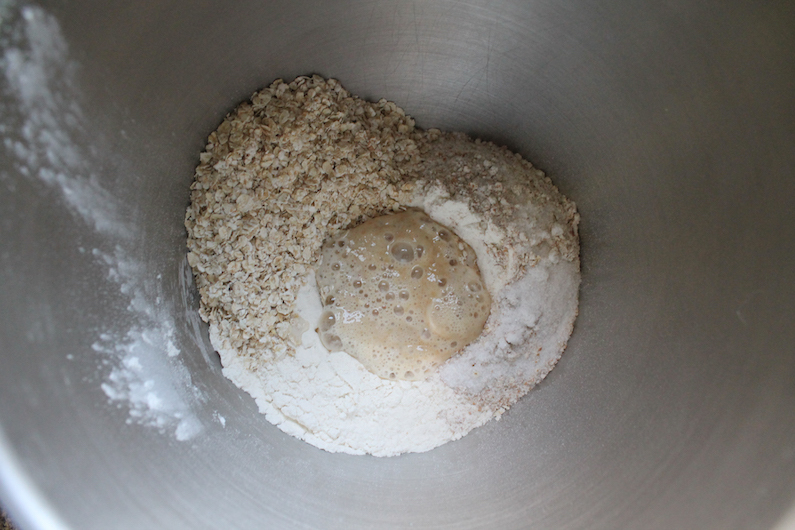 Mix the soda with the boiling water and add it to the butter mixture (it should froth up) and then add the whole lot to the oat mixture. Stir well. Use a cookie dough scoop or a couple of spoons to divide the dough into about 24 pieces, placing them on your prepared pans. Bake in your preheated oven for about 18-20 minutes or until golden brown. Rotate the pans mid way through baking time so they will brown evenly. If they are undercooked, they will be soft in the middle. If they’ve run together a little bit, just use a knife to gently separate them. Remove the biscuits from the pan while warm and transfer them to a wire rack to cool completely. Store in an airtight container for up to a week. If they last that long. Many thanks to my dear friend Glenys, for being the kind of friend who not only shares her recipes, but one whose friendship over the years has helped me stop questioning my sanity. Knowing she chose this same nomadic life means I must not be nuts, but if I’m crazy at least we are both crazy together. Everyone should be blessed with a friend like Glenys. A big thank you also to Karen from Karen’s Kitchen Stories and Holly of A Baker’s House for stepping up to create and update the link list. 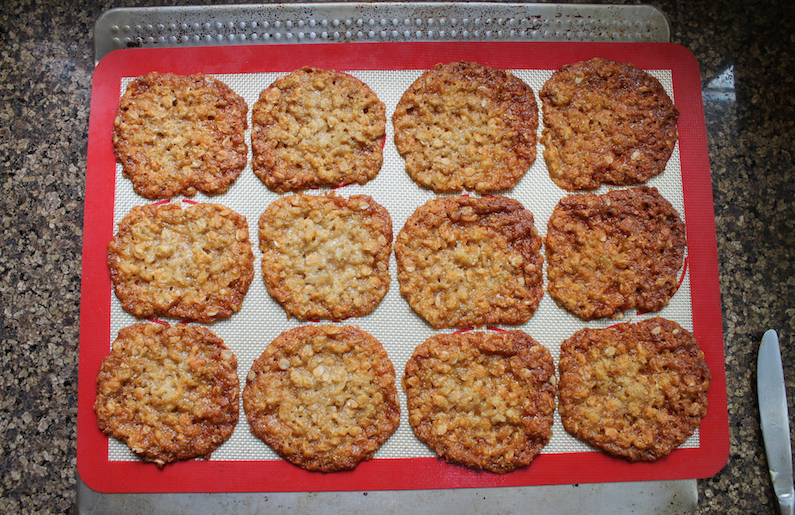 Want to see the rest of our healthy cookies? Check out the list below. 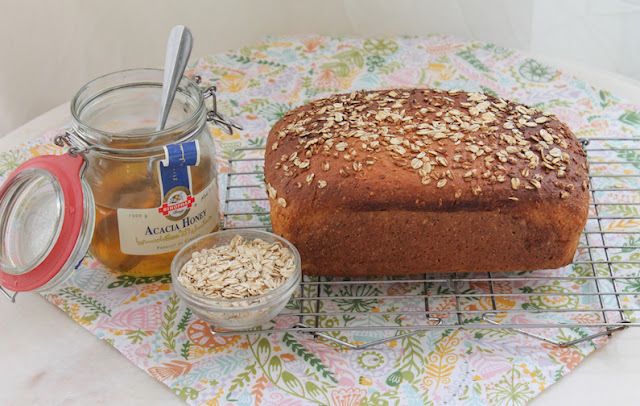 This honey oatmeal bread is baked with all-purpose flour, wholemeal flour and oats, with just enough honey to slightly sweeten it. It has a tender crumb and a crunchy golden crust. 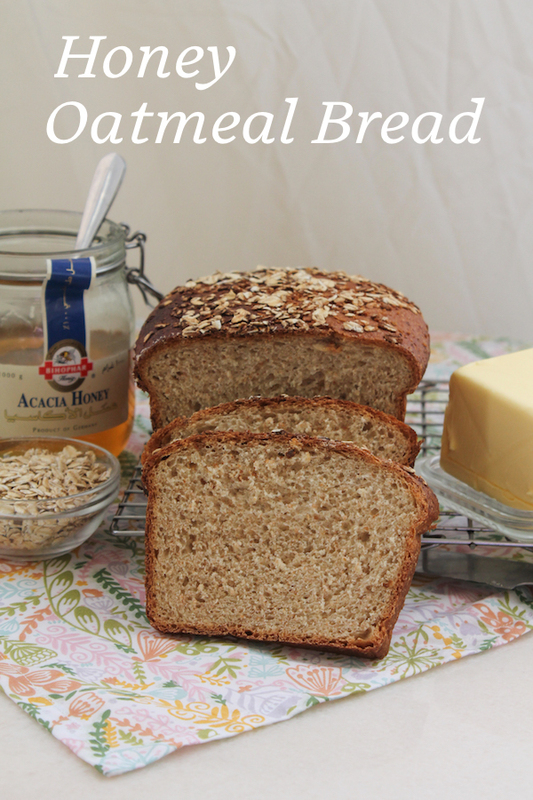 This month my Bread Bakers are here to support your efforts to eat healthier, if indeed, you are making an effort. I know there are a lot of people who make resolutions of such things this time of year. You might well be one of them. 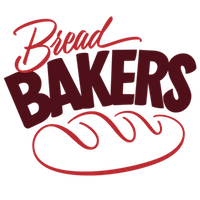 Here’s what I can promise you, even if you are not: The Bread Bakers are a talented, creative group. The breads they bake will be delicious, whatever the theme. 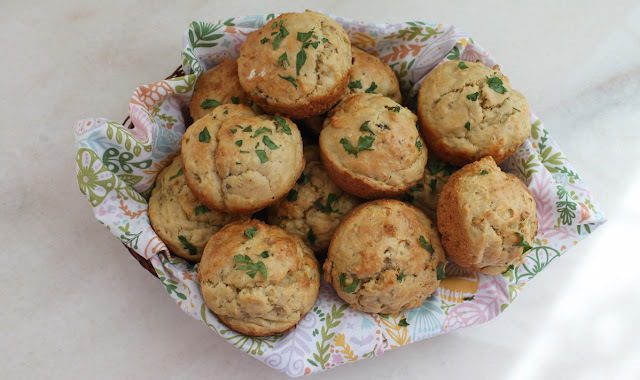 Our host today is Pavani from Cook’s Hideout and so "healthy breads" for January is her chosen theme. Since my co-creator of Bread Bakers stepped down a few months ago, Pavani has been a big help behind the scenes and I am grateful to her for stepping forward to take the first month of 2017. In fact, thanks to lots of members volunteering to host, we’ve got some great themes coming up for you this year! Stay tuned for February when we will take on pancakes. Perhaps this could be the year you start baking homemade bread! Think about it. This may be a much easier resolution to keep than most. 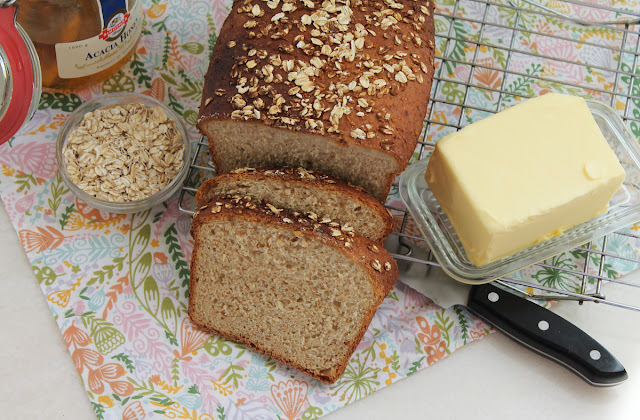 You can start with this easy honey oatmeal bread. Note: This recipe can be made by hand, however, the dough is fairly slack so kneading it will be a sticky challenge. 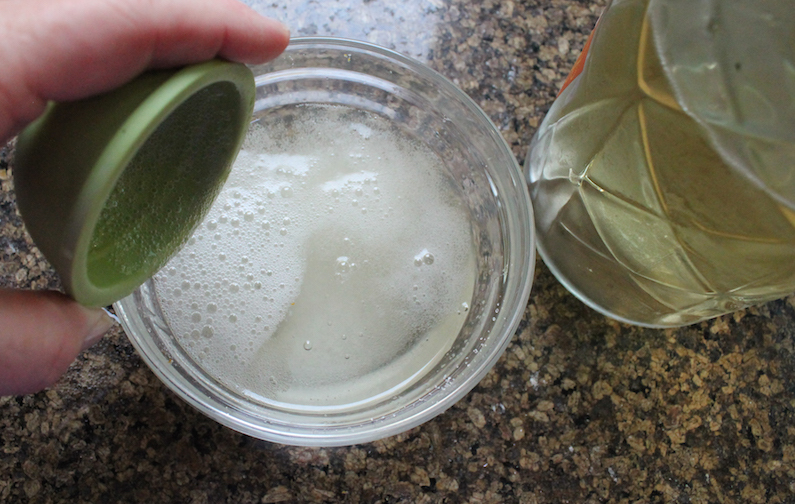 In a microwave-proof measuring jug, heat your milk and butter until the butter just melts. Allow to cool until warm. 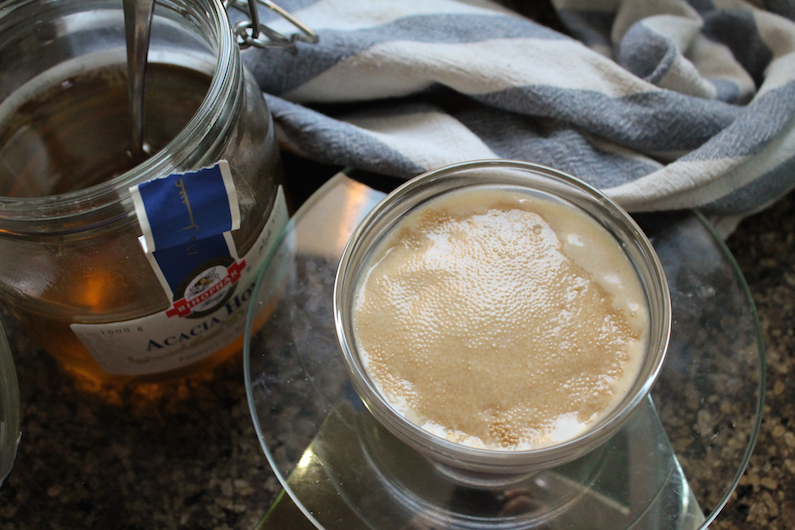 Pour in the rest of the honey. It will sink to the bottom so stir until the honey has dissolved into the milk. In the bowl of your stand mixer, add the yeast mixture to 2 cups or 250g of the all-purpose flour, the wholemeal flour, the oatmeal and salt. 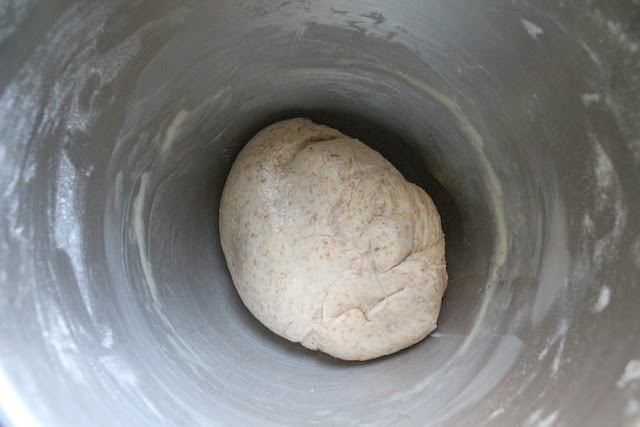 Pour in the milk/butter/honey liquid and mix until it comes together as a soft dough. 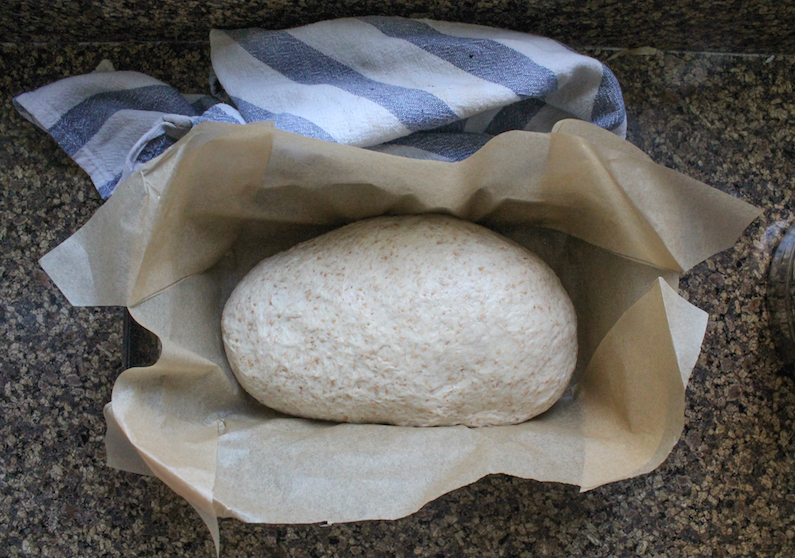 Switch to the bread hook and knead for about 5-7 minutes or until the dough becomes smooth and elastic. 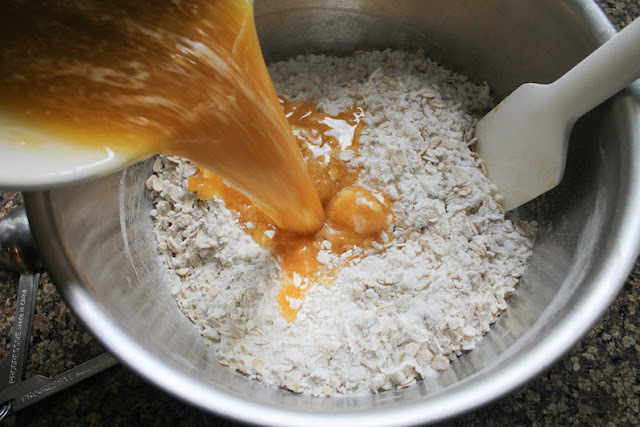 Add the extra flour, as needed, by the teaspoonful as it kneads. I ended up using about half of the additional flour for this particular loaf. 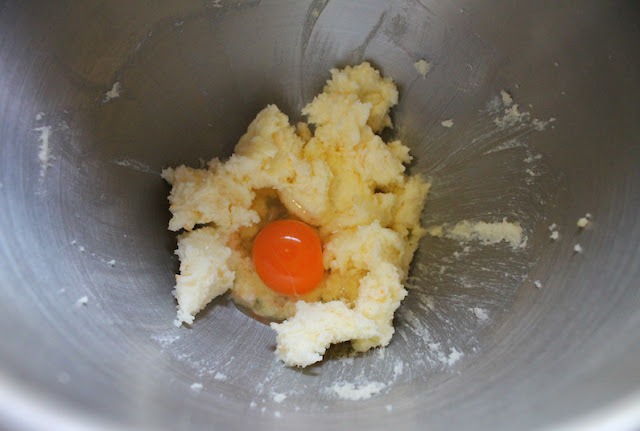 Form the dough into a ball. Use a little butter to grease the bowl, moving the dough ball around the bowl as you butter. Cover, put in a warm place and leave to rise until doubled, about 45 minutes or one hour. 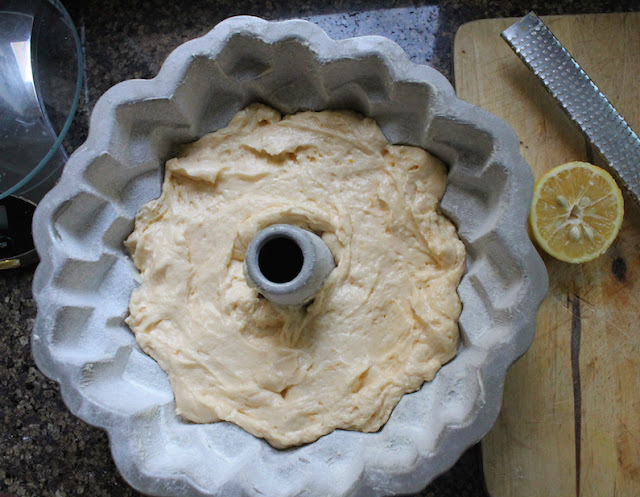 Line a standard bread pan with parchment paper or grease it liberally with more butter. My pan is not in the best condition so I always choose the parchment paper route. 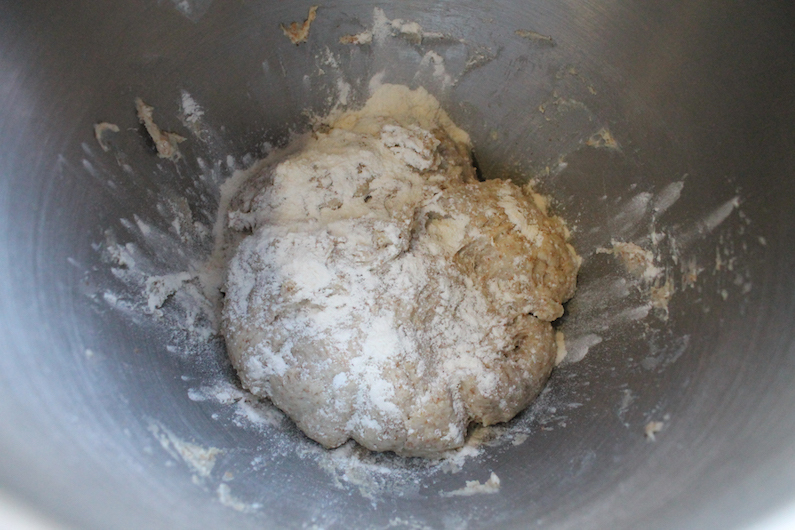 Punch the dough down and give it a few more turns of kneading. 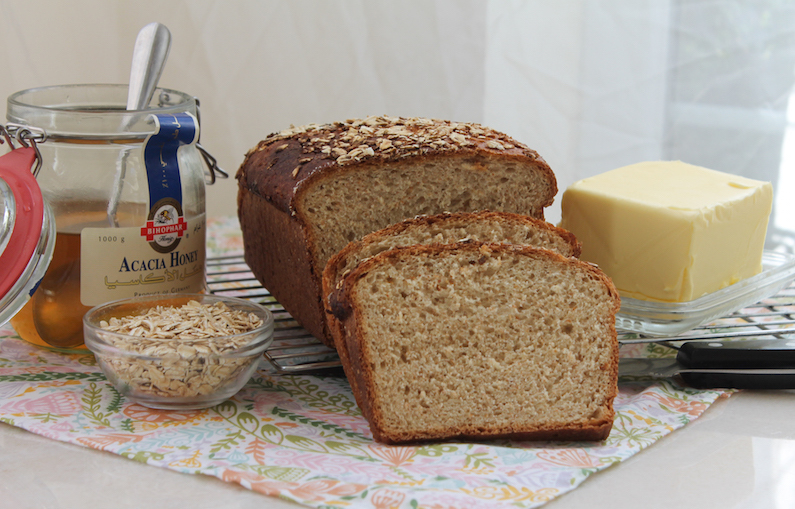 Form it into a log and put it in your prepared loaf pan. Leave to rise in a warm place until doubled again, another 45 minutes or 1 hour. Towards the end of the rising time, preheat your oven to 350°F or 180°C, placing an iron skillet or other heavy cooking pan on the bottom shelf. Boil your kettle with about 2 cups or 480ml water. 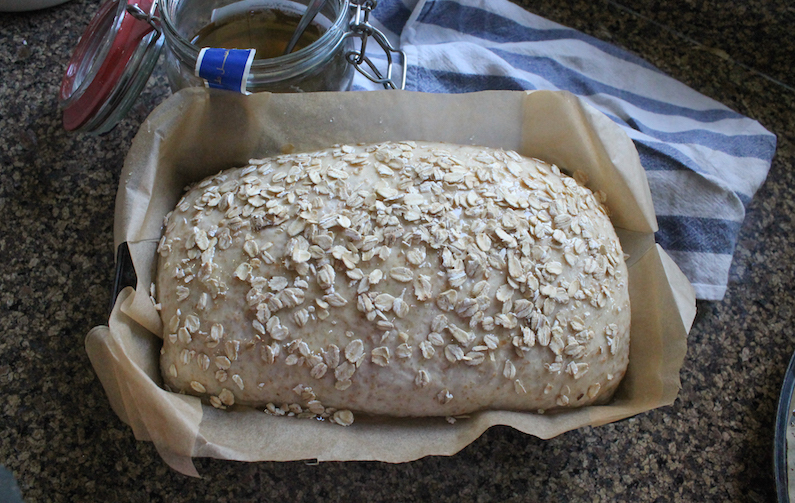 Once the dough has risen sufficiently, drizzle it with the extra honey and sprinkle on the rolled oats. Put the loaf pan on the middle shelf in the oven and pour the hot water into the heated skillet or baking pan on the bottom shelf. Quickly close the oven so the steam does not escape. Bake the loaf for about 40-45 minutes or until it’s brown all over and cooked through. If you have a instant read thermometer, the internal temperature should be 200°F or 93°C for an enriched bread made with milk and butter. 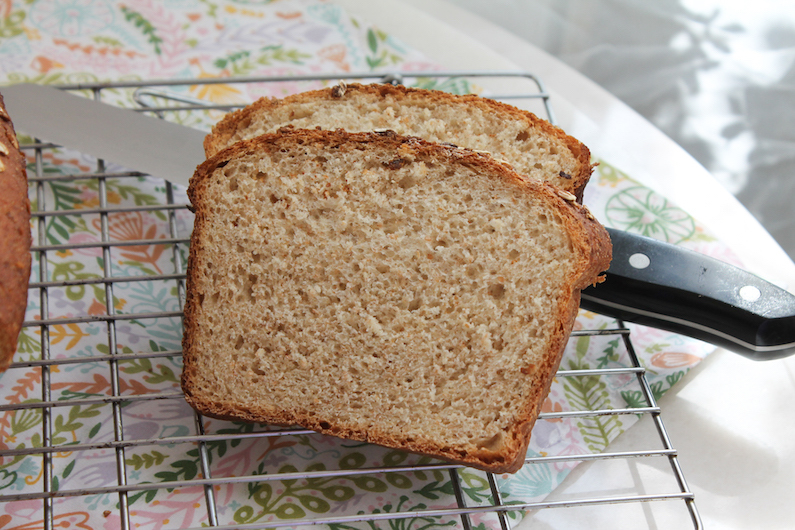 If your loaf is browning too fast, cover it lightly with a tent of foil. Remove from the oven and allow to cool before slicing.